Boomerang Spur Road starts at the end of Haunted Stream Track at Dawson City. The first couple of kilometres have some steep ascents which become slippery (clay) after some rain and would be classed as medium. 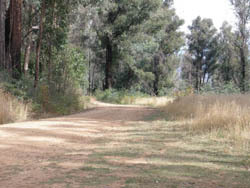 Once onto Baldhead Road, this is a smoother graded track which would be classed as easy in most weather conditions. Seldom Seen Hut is on the corner of Baldhead Road and Jones Road.